In your trading software, a candlestick can stand for various time frames, from minutes to days and even weeks and months. Candlesticks are formed by using the open, high, low, and close of the chosen time period. The shadow is the movement of the market during the entire time period. The colour is by default white and black but I have chosen to use green and red as that is how I view my chart. 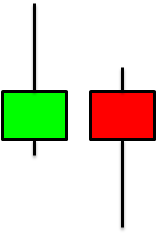 A white (green in the figure) candlestick usually means that the closing price of the time period is higher than the opening of the time period. So if you have a buy order at the opening price you see many white (green) candlesticks later, you will be making profits. A black (red in the figure) candlestick usually means that the closing price of the time period is lower than the opening price of the time period. This candlestick is what you want to see when you have a sell order as you can buy back the currency pair at a much lower price. The high is the highest price reached during that specific time period and the low is the lowest price reached. 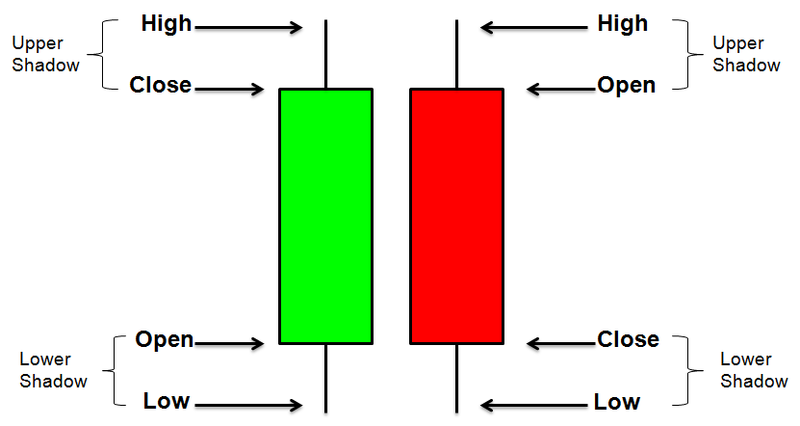 Anything that is not in the real body (fat rectangles shown by the green and red body) is known as shadows and depict the movements of the market. As you might observe, the long body on the right shows higher buying pressure whereas the shorter body on the left shows much lesser buying pressure. For this example, we see that the longer the body is, the further the close is to the opening price of the market. This means that market price increases considerably from the opening to the closing, showing strong buying pressure. The reverse is also true for a red candlestick. For a red candlestick, the longer the body, the more dominant the selling pressure is. Understanding how buying and selling pressure influences the shape of the candlestick is step 1 to effectively using the candlesticks to trade. Think about how you can decipher a short body candlestick versus a long body candlestick. 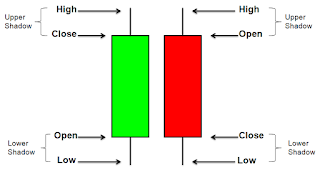 Lets say that there is an uptrend, with numerous long green body candlesticks followed by a short body red candlestick, does it means that the uptrend is over? Personally, I would look at the next candlestick to determine the possible end in the uptrend. However, if what follows the uptrend is a long body red candlestick, the chances of the uptrend ending is more plausible.